Three comics from December 4, 2013. Plus your very own Nerd Confessions featuring your favorite female comics characters. And as always Aaron's (Irreverent) Inner Child. 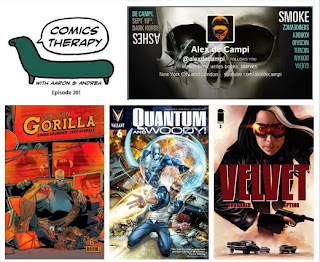 On The Couch this week: writer Alex de Campi. Theme of the show is money, power, women. Or is it money, power, women? We're a little unclear as to which comes first in the order of acquisition, but everyone agrees that all three are desirable, right? And potentially deadly. Alex de Campi is a writer and director, known best for her Eisner-nominated series Smoke and the 2011 followup Ashes. She is currently writing Grindhouse for Dark Horse and her comic Valentine is now published digitally on every Wednesday on Thrillbent.com. Alex mentioned A TON of movies, comics and books during our conversation. We've tried to capture as many of them below for your reference. Alex also picked the music for the theme power, money, women. She talks about her choices in the interview. They're pretty fantastic.